There isn't too much to report today and I actually held off on writing another blog post. 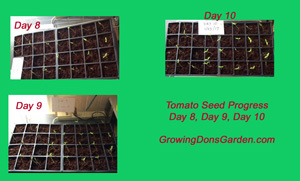 The tomato seeds are doing well and the plants are growing each day. 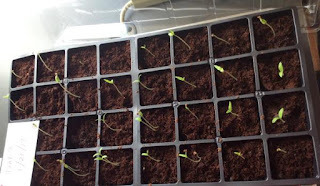 Most of the tomato seeds have germinated but not all. I expected to see some that didn't germinate and emerge. It looks like all but two germinated. One thing I get a kick out of is watching how these plants orient themselves to the light source. When the sun comes up and I have the window blinds open, they lean this direction. As the sun sets and it gets dark outside at night, then they lean back up towards the light in the center of the room. Of course, I realize plants do this, but I didn't realize just how quickly they adjust. Maybe I should find a way to do a video of it because it seems like it is pretty quick. It amazes me how the plants do that and know where to go. I don't understand the mechanism that causes it but I'll be doing some reading to understand it. I just find it interesting and amusing watching these tomato plants. My other question I need to research is will these plants be able to grow enough in these little seed starting pods or am I going to have to transplant them before they get to the Earthbox. 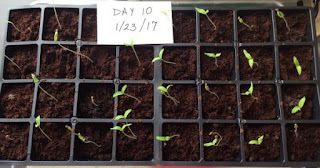 I'm not sure what to expect on this because they are still a good month from being planted in the Earthbox. So here are the most recent pictures by day. Hopefully you did get a chance to watch the most recent YouTube Videos I have done on these tomato plants? If not, check these YouTube videos out and see up close what is happening. Keep checking back to watch the progress. 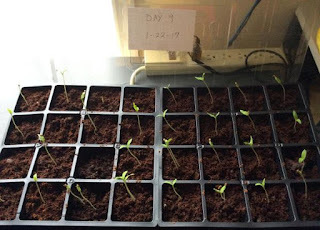 Feel free to offer any tips you have on growing tomato seedlings. You are welcomed and encouraged to share the LINK to this blog post.